2.8 million workplace injuries occur every year in the US alone.This equates to 1 injury every 11 seconds. With proper training and safety awareness, 100% of these accidents could be avoided. OSHA (Occupational Safety & Health Administration) inspects US workplaces to assure safety of employees, cite safety violations when found, and assess fines to the employer for violating safe workplace standards. The #2 most frequently cited violation is Hazard Communication Failure (a.k.a. lack of safety signage). It's also their 9th highest penalty offence and OSHA fines aren't cheap. Fines for serious offenses can be up to $7,000. Repeat violations fines can be up to $70,000 per offense. Many companies now focus on improving efficiency as a way to reduce overall waste of time, resources, and money. LEAN (sometimes referred to as Lean Manufacturing) is a set of principles and practices that aims to reduce these wastes through improved workflow, better organization, and constant improvement. Lean can be found in many forms, but the main goals of each practice revolve around visual and workflow efficiency. Safety - Keep your employees safe by labeling all workplace hazards including dangerous equipment, locations, and activities. Organization - Create labels to organize your work and storage areas. These labels are a critical part of any 5S or lean program. Arc Flash - Arc flash explosions are a preventable hazard. Label your arc flash boundaries, PPE requirements & other info. 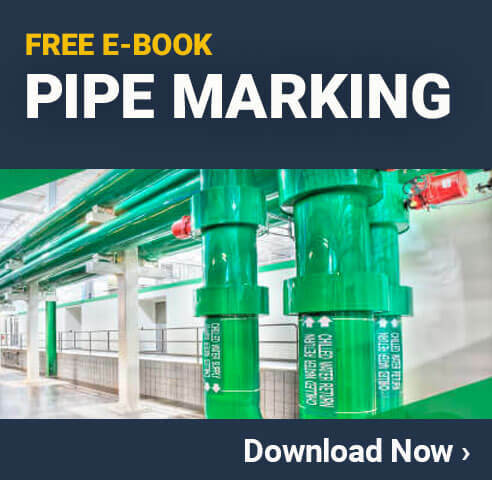 Pipe Marking - Label the contents and flow direction of the pipes in your facility so they are easy for everyone to identify. HazMat - Chemical containers should be labeled with the contents and the risks the chemical poses using NFPA or GHS labels. Inventory - Create labels for your warehouse racks and monitor your inventory levels for Kanban and other Just-In-Time methods. First Aid - Identify locations of first aid equipment like eyewash stations and first aid kits, and create signage for first aid procedures. Barcodes - Create barcode labels for any purpose. Barcode labels are often critical for shipping and inventory tracking. We offer a variety of popular labels and signs on our website. #1 selling labeling printer is the LabelTac 4. Industrial label printers serve many functions in the workplace. Businesses use them to print safety labels, organizational labels for 5S or Lean, barcodes, inventory labels, pipe marking labels, and more. This infographic about the importance of industrial label printers explains the many uses of these tools and includes information about the importance of safety awareness in the workplace, which labels can help increase.